Regional Information Center "CARPATHIANS" » VOROCHOVSKI CLIFFS. 48°41′ 18″ N lat; 22°25′ 34″ E long. 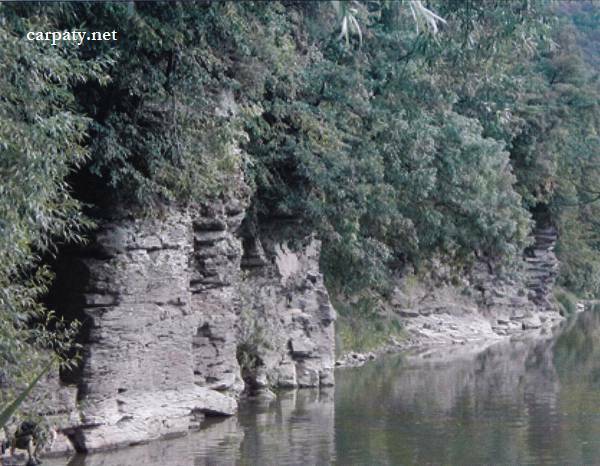 In the left bank of Uzh River covered by bushy forest due to extensive bank side erosion have been formed rocky cliffs more than 100 m long and up to 10 m height where andesite lavas are exposed. They had been erupted from the central and side craters of the largest Trans-Carpathian volcano — Antalovetska volcanic-tectonic structure (absolute age ~ 9.5 Ma) which central portion is discovered some kilometers eastward at site of modern Antalovetska Polyana Mountain. Combination of the rocky cliffs and wide river sandbank give beautiful landscape which attracts numerous tourists and campers. Accessible by motor-car up to the hanging bridge then 100 m by walk.